Outsourcing allows you, as a design company, to take on more work, increase your productivity and your bottom line. It also reduces the stress on your staff by allowing them time to focus on your clients that need that extra attention. 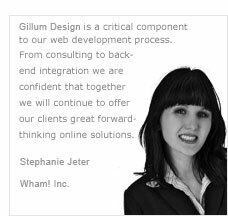 Many design agencies and marketing firms outsource their projects to Gillum Design. I can handle your overflow and still meet your deadline. You are the voice for your company, not me, when working with your clients. You take full credit for the project. In essence, I am a remote member of your team. Complementary, Not Competitive I offer no competing services. Most web development shops also offer design services like yours. We're focused 100% on working for you, not competing with you. No Offshore Programmers Cheap, offshore development is enticing. Who wouldn't be interested in $10/hour labor? Trouble is, for the level of visual perfection you expect, a team in Timbuktu isn't going to cut it. No worries. I am right here in the good ol' U.S. of A. From Simple to Complex I have the capabilities ranging from building small websites for your clients to architecting complex web applications, e-commerce sites, and other cutting edge projects. You're a professional designer/developer. I am a professional designer/programmer. If you give me a project, I'll bring it to life. And (hold on to your seat) it'll look exactly as you've designed it. You're happy. Your client is happy. We're happy. We're all happy. Gillum Design © 1997 - 2019. All Rights Reserved.